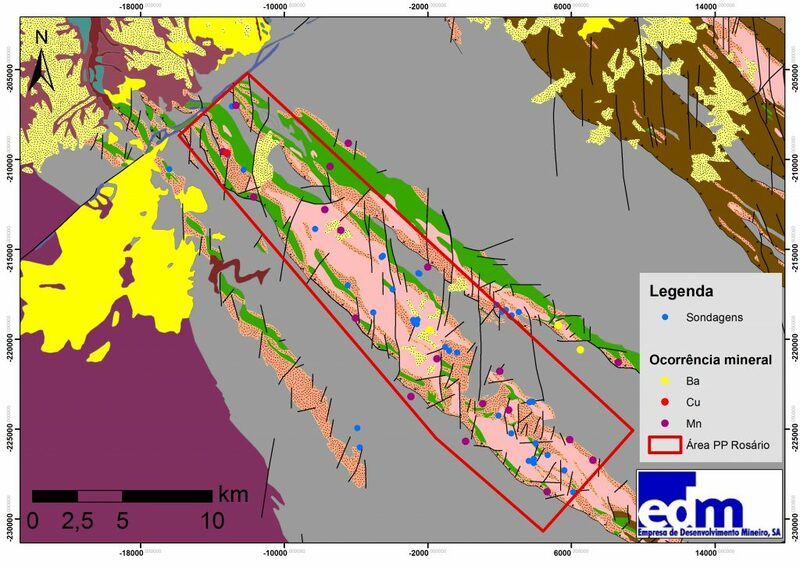 EDM holds the prospecting and research rights over mineral deposits including copper, lead, zinc, silver, gold and associated minerals for an area called Rosário. This area is located in the central sector of one of the world’s major metallogenetic provinces hosting deposits of massive sulphides rich in base metals, which is the Iberian Pyrite Belt (IPB). The prospecting and research agreement was signed on 23 November 2016, with the Portuguese State, and is expected to last for a minimum of three years. This area is located in the lower Alentejo, in the municipalities of Castro Verde, Ourique, Almodôvar and Aljustrel, in the district of Beja. 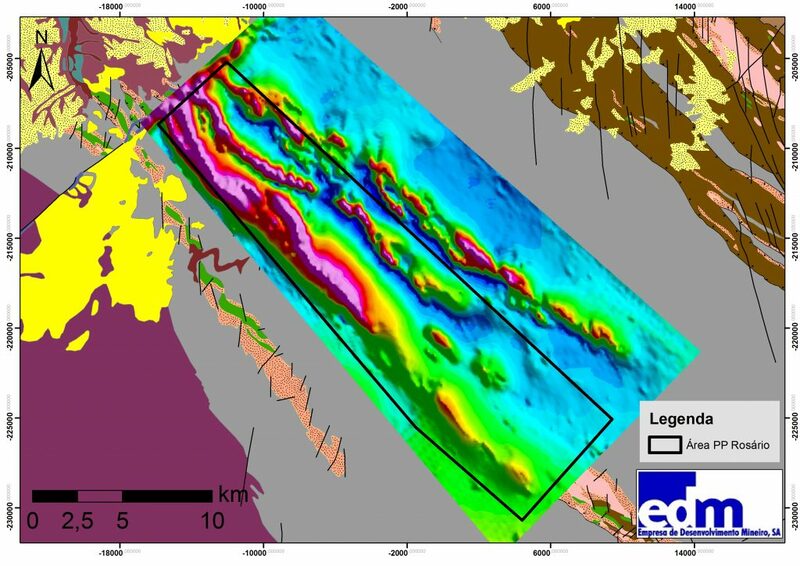 The area of exploration and research has a general NW-SE orientation and extends over 202.5 km2, with the SE of the Neves Corvo mine stretching to the Messejana fault, situated in the far NW. This area is known for numerous mineralizations of manganese which, due to their size, were mined in the past. Other minor occurrences of the minerals barium, lead and copper have also been identified in the area. At the NW edge of the area is located the mineralization of massive sulphides of Montinho, which was mined in the first half of the twentieth century. The IPB is one of the most important metallogenetic provinces in the world for deposits of base metal massive sulphides associated with volcanic and sedimentary rocks, extending between Grândola and Seville, along a strip around 250 Km long and 60 km wide, which equals an area of approximately 12,500 Km2. Turbiditic sediments with flysch-type facies (shale, greywacke and some conglomerates) several kilometres thick, which make up the Baixo Alentejo Flysch Group (BAFG), were deposited on the VSC, represented in this area by the Mértola formation from the Visean-Upper Serpukhovian period. The Varisco regional folding deformed this sequence, generating an antiform in a NW-SE direction with an axis tilting to the SE and vergency to the SW. This folding is also responsible for the development of overthrust with vergency to the SW which are responsible for the nesting and stacking of geological units, which leads to repetition of the lithostratigraphic sequence. 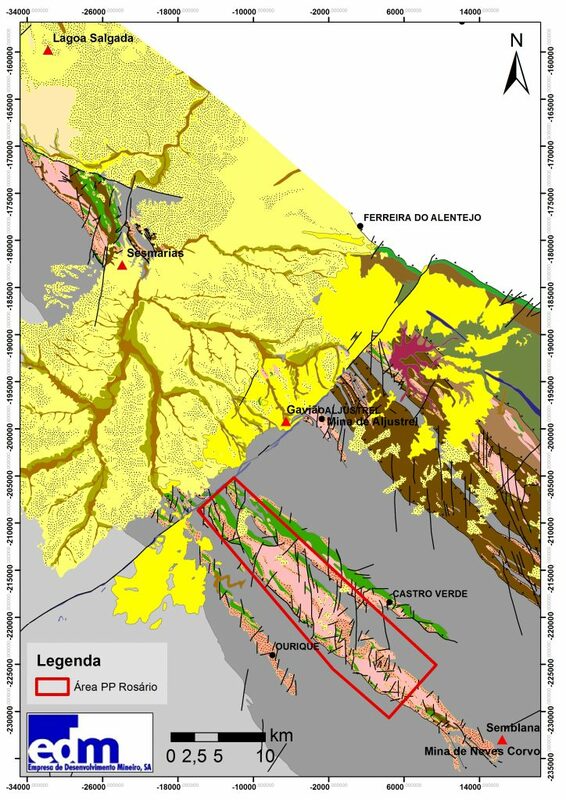 Recent studies indicate that the lithostratigraphic sequence present in the Rosário area is equivalent and correlative to the one identified at the Neves Corvo mine. Volcanic and schistous units were recognized in the Rosário with an age and characteristics similar to those occurring in the mine and which are associated with the mineralization. A transport of sediment load was also identified that may be correlated to the Neves Corvo transport of sediment load. This transport of sediment load is particularly important because in the mine it corresponds to the soil layer below which mineralization occurs. In the Rosário area, near the NW edge, is located the mineralization of massive sulphides of Montinho, which is characterized by the occurrence of various small masses and was mined in the first half of the twentieth century. Close to the contact point of the VSC with the Mértola formation and within the VSC dozens of manganese occurrences are known hosted in the layer of purple-red tuffaceous schist and jaspers. Many of these occurrences have been explored in the past, in particular the Ferragudo and Filipeja mines due to their size. Some mineralizations of Barium in late Variscan faults are known that may have associated lead mineralizations. These faults may also be carriers of copper mineralizations. Several prospecting programmes were carried out on this area, as seen in the sectors of the IPB where the VSC arises. During these programmes, regional geological surveys were carried out, along with regional geophysical and geochemical surveys, and detailed surveys that established various anomalies. Various mechanical probings at varying depths were also performed. In the area to the SE of the Rosário, seismic surveys were performed that allowed the geological structure to be established in depth. Reinterpretation of the available information in light of recent knowledge developed for this sector of the IPB, also taking into account recent data on the geology of the Neves Corvo mine, associated with the realization of new geophysical surveys, as well as the execution of detailed geological mapping of key sectors of the field, will allow the identification and selection of target areas to be investigated through deep mechanical probings.